10:00, 12:30 and 2:30 p.m.
Deutschheim State Historic Site is dedicated to the preservation of the culture and heritage of the Germans who migrated to Missouri in the 19th century. Deutschheim (Deutsch = German, Heim = home) was a term used by early German writers to describe 1820 to 1860 Missouri. During the 19th century, the eastern end of the Missouri River valley witnessed an extraordinary migration of German people. Influenced in part by Gottfried Duden in his “Report of a Journey to the Western States of Northern America,” thousands of farmers, artisans, craftsmen, brewers and wine makers migrated to Missouri along with intellectuals and political activists. 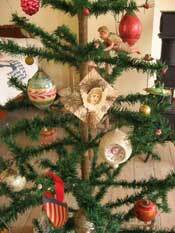 Early German Christmas ornaments are part of Deutschheim’s annual Weinachtsfest display. Germany’s loss was Missouri’s gain. Missouri benefited in countless ways from the addition of these industrious and ambitious people to the ranks of its population. The solid houses, barns, churches and commercial buildings they built in stone, brick and timber lend considerable charm and quaintness to the rural and urban landscapes they settled. Middle-class Germans established schools, libraries, institutions of higher learning, newspapers, a wide array of cultural opportunities, and a variety of successful businesses and industrial concerns. German peasants opened up the land and created prosperous farms and villages on wilderness land that many other Americans avoided because it was regarded as substandard. The advanced farming techniques of rural Germans proved them wrong. 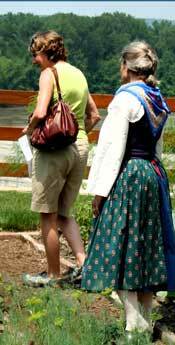 Many peasants wrote home about their good fortune and were joined in Missouri by friends and relatives. Whenever possible, the newcomers settled close together with others from their old country neighborhoods, making enclaves of the Old World in the New World where German regional customs and variants of language were preserved for generations. In some instances, organized settlement societies were established to facilitate group migration. 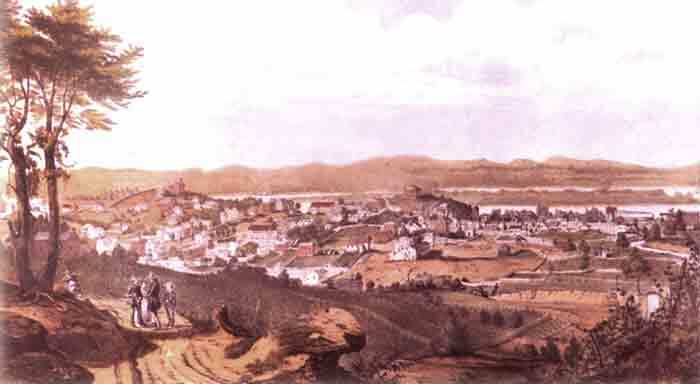 One such group, the German Settlement Society of Philadelphia, founded the town of Hermann. A board of managers prepared a constitution in 1836 and established membership by selling shares of stock in the enterprise. Eleven thousand acres of Missouri land were purchased and the town of Hermann was platted. The goal was to create a culturally integrated, self-supporting colony built around farming, commerce and industry. This was to be the “heart of German-America” where the customs, language and traditions of the fatherland could be transplanted into a New World setting, untrammeled by the upheavals and restrictions that prevailed in the German states. Today, this German heritage has been preserved at Deutschheim State Historic Site. In 1978, a local preservation group, the Hermann Brush and Palette Club, donated the buildings that make up the historic site to the Missouri Department of Natural Resources.